The refractor was the first astronomical telescope. Lens making was a well practiced craft by the 1600s, and it was not long before the craftsmen of the day put two lenses together—a large one in front and a small one at the focal point as an eyepiece to create an instrument that could bring distant objects closer. Contrary to popular belief, Galileo did not invent the first telescope, nor was he the first to make astronomical observations with one. Jacob Metius in the Netherlands developed a ‘spyglass’ in 1608. The objective lens was about 15 mm in diameter. The eyepiece was a double concave lens. Metius’ spyglass had a magnification of only about 3x. Englishman Thomas Harriott bought one of Metius' spyglasses in July of 1609, and pointed it at the moon. Over the next few years he made many drawings of our satellite, which show many of the features we are now so familiar with. Several months after Harriott first viewed the moon, Galileo took Metius’ concept and built his own telescope. It was 38 inches long. He gradually improved it with a larger objective lens, which gave him more light gathering power, and a longer tube, eventually five to six feet, which gave him more magnification—eventually about 30x, and he mounted it on a stand which steadied it to make viewing more stable. Lens development continued through the 18th century, and larger telescopes were built. 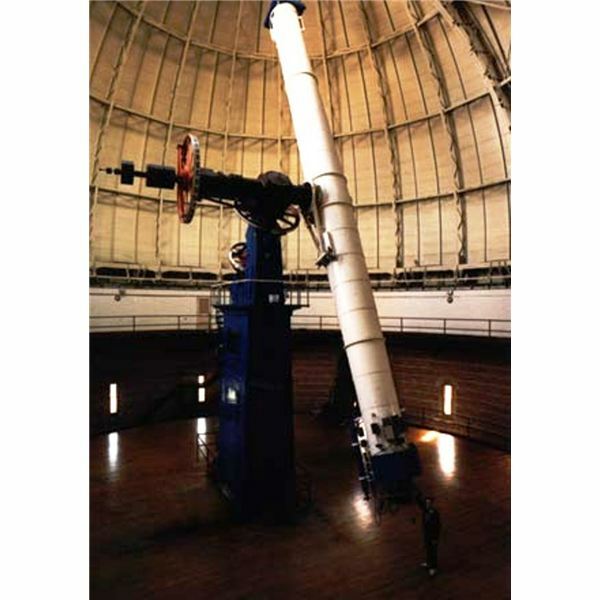 Finally, by 1895, astronomer George Hale pulled together the funding and resources to build the largest one ever built to that time—the 40-inch, 60 foot long Yerkes refractor at the University of Chicago. This would be the last large refractor ever built. The 40-inch objective was so heavy it sagged under its own weight. It had to be rotated periodically to maintain its symmetry. Today, astronomical refractors are relegated to Christmas gifts. These usually have 60mm objectives and a focal length (fl) of f10 or f12. They are designed primarily for planetary viewing. As children many of us had, or wanted, a "spyglass"—that telescoping device pirates, and the pursuing navies, stood on the deck and looked through to spot their prey or pursuers. The first spyglasses were just like Galileo’s original telescope—an objective and eyepiece. Then telescope makers discovered if they put a double concave lens between the objective and the eyepiece, the magnification could be varied by moving the concave lens. Thus was born the telescoping spyglass. In fact, my first telescope was just such an instrument. It had a 60mm objective, and could be varied from 30x to 60x. I got my first "close-up" views of the moon through this wonder. Of course, at 60x the moon shook like crazy. Today, refractors are used as spotting scopes, telescopic scopes for rifles, and many camera lenses, particularly telescopic long range lenses. These are all variations of the "pirate" spyglass of yore—much more sophisticated. 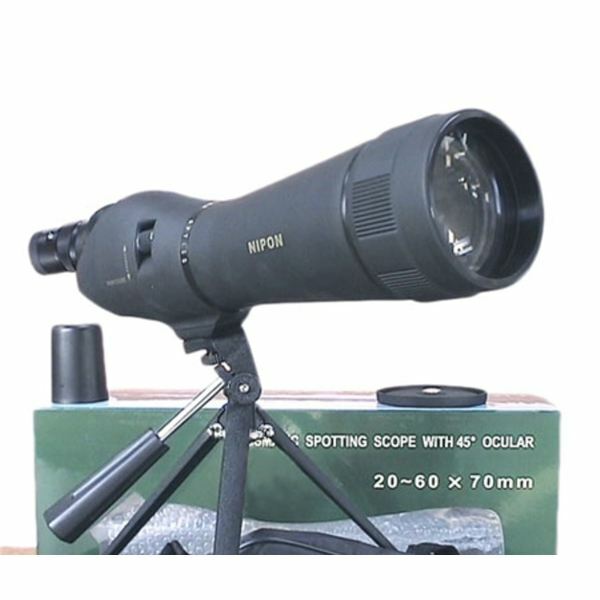 For example, a spotting scope may have a folded light path. 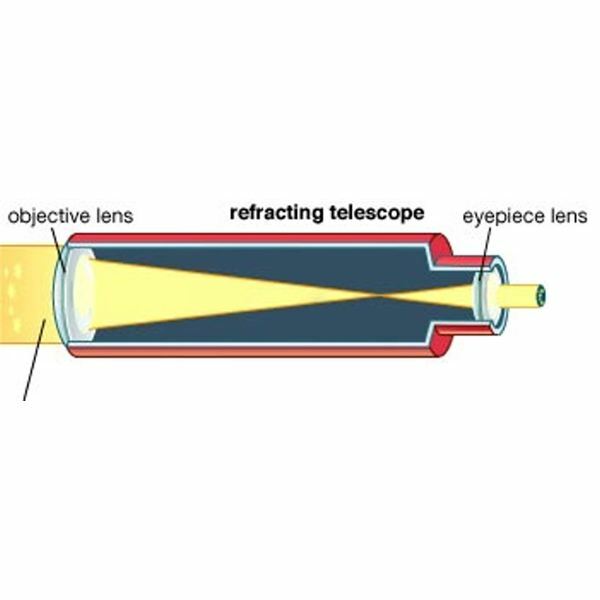 That is, the light from the objective goes through a series of lenses and then is bent upwards by a prism to another series of lenses which directs the light to the eyepiece. This enables the telescope maker to provide a fairly long focal length—giving high power—in a compact body. There are many more parts to these refractors, but they all share two characteristics with the originals—an objective lens and an eyepiece.